Kia ora everyone and welcome to our update for June and what is a rapidly disappearing year! 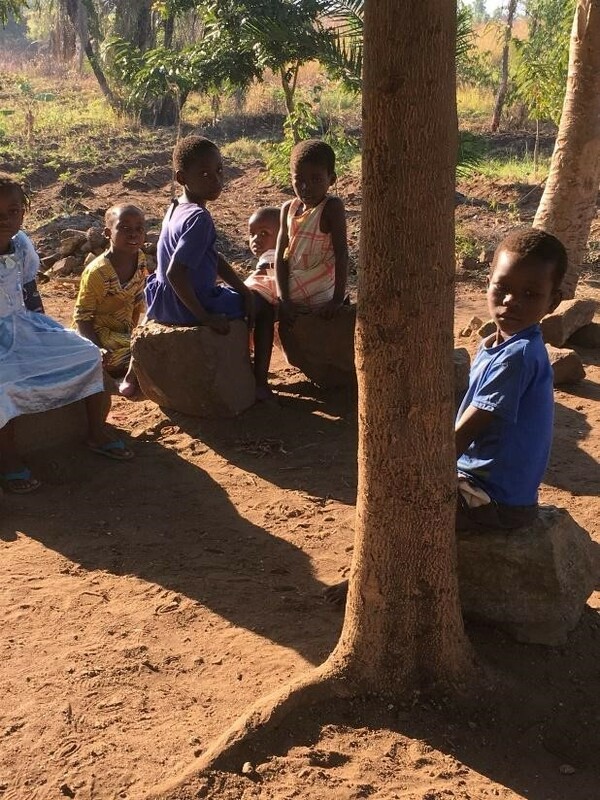 In Malawi Regina continues to be extremely busy juggling both the schooling of our kids and the everyday demands of Mphatikizo. Sadly, the month of May saw the passing away of two local children, one from TB and the other from malaria. The ages of these two kids was 6 and 4 respectively, unfortunately the all too common reality of life in rural Africa. Mphatikizo assisted both families with the funeral costs and also the transport cost for the young TB victim’s body from Blantyre where it had been taken. The government refused to provide an ambulance and so, with the family being unable to provide any money, the poor child was left in Limbo. Mphatikizo organised the funding for the ambulance required to transport her home to the family for the funeral. Assisting local families with funeral costs gives Mphatikizo a huge footing in the community. It helps local families in times of grief immeasurably and, unfortunately, is required far too often. Both these kids attended our preschool and were very much a part of Mphatikizo. They will be sadly missed by many. 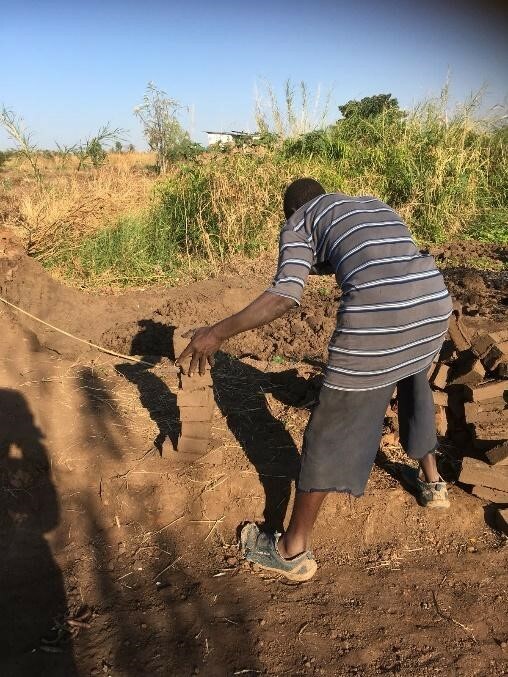 The picture on the right shows the remaining bricks being made that are required to finish the kitchen for the preschool. Currently, the women prepare the meals outside, but with both the high numbers of children attending and the need to provide a sanitary preparation area, it was decided to construct a stand-alone kitchen. 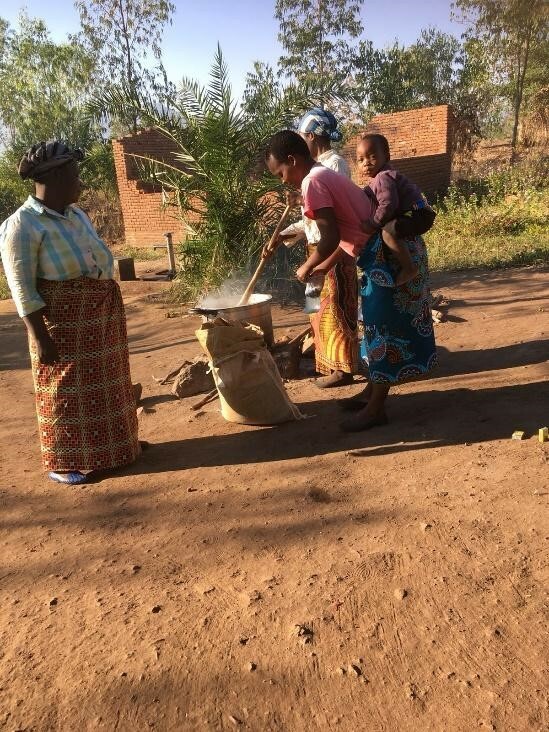 The picture below shows the women cooking the Likuni Palor for the kids and in the background you can see the partially completed building. Due to our sad loss of the two kids this week and the fact one passed on from TB, all the kids were given health checkups by a group of local doctors from a clinic in Zomba. Thankfully none of the other children showed symptoms. On the project front, the market garden is slowly taking shape and this week saw the arrival of some 14 volunteers from a neighbouring village who spent several days preparing beds for the gardens surrounding the orphanage. They have slept in the dorms and were fed by Mphatikizo, but, according to Regina and Simeon, the gardener worked extremely hard and did some fantastic work. This kind of community input is very much what Mphatikizo is trying to achieve and, going forward, is the only true way for us to be both effective and sustainable in Malawi. This is very much a win for us and very beneficial to the community. 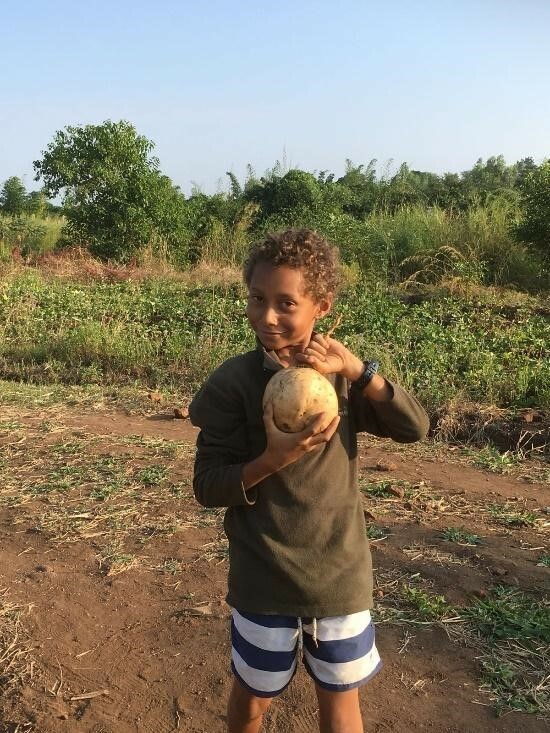 Also on the market garden front, the picture on the right shows Joshua with one of the many sweet potatoes recently harvested from the orphanage gardens, which will be used both to feed the children and help those families in the community struggling with food. This year the gardens have provided not only potatoes, but also kidney beans, bananas and a small amount of rice. This is an awesome result considering the market garden project has not officially begun! It shows great promise and who knows what can be achieved given some proper funding and structure. I will finish this update here with the promise that the next one will not take so long to reach you. I have not managed to cover all that, together, we have achieved in Malawi these last few months, but will remedy that with more regular newsletters as I overcome my inadequacies with Microsoft word!! On behalf of myself, Regina and the kids, thank you for your ongoing love and support. We are making inroads in the Machinga district and a real difference to many peoples’ lives.